I started writing this post in January as an overview of the Obama White House. Time hasn’t been on my side to keep this blog active. But today is the 100th day in office for a new U.S. President; the re-emergence of the previous President in the public eye since leaving the White House. I thought this would be a good time to finish and post. I also think it’s no accident the former President and First Lady are making their first public appearances close to the first 100 days of the Trump presidency. My expectations were met in the Obama presidency. A level-headed, no drama President Obama completed two terms without major scandals and with key and historical national and foreign policy accomplishments mixed in with the regular messes, missteps, misspeaks, and coulda-woulda-shouldas for the file. Expectations of the symbolic Obama and the presidency seemed to be higher. And November 8, 2016 brought much of that crashing back to earth, or should I say reality. For those of us who are over 20 years of age, Obama’s election was a watershed event in the hearts and minds of those who embrace King’s “I have a dream” as a roadmap to a promised land or the visions of a Stevie Wonder medley. 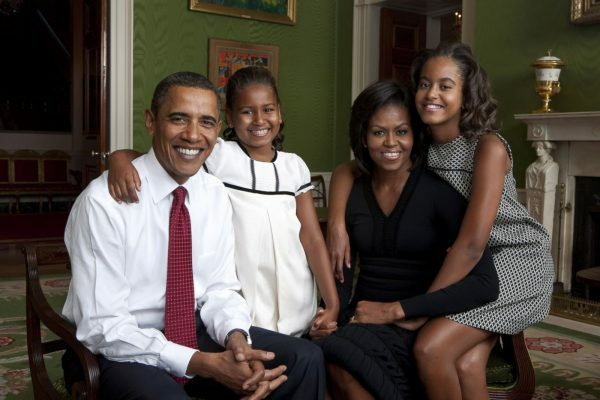 The Obamas flipped the cultural optics of a first family with the sensibilities of a contemporary traditional professional class African American family. They were the real-life Huxtables another symbolic family of 80s TV fame whose existence in the Reagan and HW Bush years was often critiqued by the “realists” as an African American fairy tale. But on that November night in 2008 the symbolic Obama gave the nation a moment to exhale on the American conversation [obsession] on race. A vote for Obama and the resulting victory made us believe — in the heat of the moment — the nation was moving away from its ugly racist past. Some white voters who didn’t march with King or memorized the “dream” speech could believe he/she was absolved from the sin and burden of racism in the voting booth. There was a speed bump involving Obama’s Chicago pastor during the campaign but the candidate swerved into a teaching moment. And the pastor appears to be in good shape now well into his retirement as a senior minister. I’ve seen him. He looks grounded and at peace. The symbolic Obamas gave African Americans a cultural [fist] bump. White House [house] parties, elegance at the right time at the right moment, the essence of cool without resentment. There was no need to paint the White House Black with the Obamas in residence. You could say there was an Asian American [fist] bump. Persons paying close attention recognized it. The president’s maternal sister was in DC from time-to-time while her husband was director of the Smithsonian Asian Pacific American Center. The President lived in Indonesia with his mother, sister, and stepfather. This President had a familiarity with the region and culture that couldn’t be had with a Peace Corp assignment. Indonesia, Hawaii especially were for a time home. Progressives wanted to party and fist bump too before reading Barack Obama’s The Audacity of Hope. I constantly reminded them to read the book before their good vibes began to twist and shout. Obama’s politics were pragmatic. He was greatly influenced and raised by Depression-era grandparents from the American heartland That gives you a certain perspective on things. Though some of the symbolic gestures and speeches of the Obama presidency didn’t yield the desired results, an unexpected presidential cultural shift, with fist bumps and high fives came from the LGBTQ community. Hiring practices and benefits for government contractors and agencies were required to be inclusive. Military health benefits were extended to transgender servicepersons and their families. Washington, DC became a destination for 20 and 30 somethings eager to change the world. Real estate got so hot in DC developers could be seen as the new blaze engulfing city blocks previously damaged by the 1968 riots and left to decay to bargain basement property values – as planned (more about that below). Restaurants were popping up everywhere. DC was in Bon Appetit and Michelin decided to add the city to their guidebook series. Bartenders became mixologists. People boastfully posted photos of any kind of White House invitation on their Facebook, Instagram, and Twitter pages. When Michelle Obama called the executive mansion “The Peoples House” the people took it to heart waiting for that magic moment to be invited over. The Obamas gave the city a symbolic pop culture fist bump that fueled the city’s grand revitalization plan. The plan made DC more attractive to the first family of foodies, patrons of live performances, bookstores, and volunteers with local organizations like Miriam’s Kitchen and Martha’s Table. But the good vibes party didn’t overwhelm the nation’s capital. The Hill was determined to stand apart from DC proper and the White House. On day one of the “Yes We Can” Obama presidency, an obstinate Republican strategy of “No You Won’t” went into effect. The new President came in with an extended hand of bipartisan goodwill to push important policy. Symbols are allowed to exist within their own niche, but their power has to be contained to prevent a nationwide infection. And the strategy of “No” produced the desired results for the Republican party at the ballot box in 2010, 2012 and 2016. Despite the challenges, the Obama administration pressed on using the tools at hand – executive orders — and their allies to maneuver. But without the “we” this administration could only do so much especially on national issues. Public policy makers are held in low regard. Mistrust abounds. In this kind of environment, it is understandable that change would become the watchword of this time. This is not to say President Obama and his policies were above a critique. But what was the transformative idea. How quickly we forget what it takes to do the job which, unless you want a dictatorship, can’t be accomplished by a single individual. Call it democracy, gamesmanship, bureaucracy. Bottom line is people. What didn’t WE do over the last 8 years? Good vibes doesn’t seem to be a great motivator to action. Anger still works and since November there’s been a lot of action lately. We’re now into “March madness” here in DC– not with a ball but with feet, wheels, whatever it takes to be counted on the mall for [insert] cause. Today is the People’s Climate March. We all want to breathe no? Depression-era elders explained the POTUS to me this way: “Don’t look at the man (or the woman someday). Look at the office.” That’s difficult in the first 100 days of this administration than ever. But even with the Trump presidency it’s a way forward for me at least. The Congress and how it interacts with the Executive Branch deserves more attention than Tweet storms, theatrical press conferences, and SNL sketches. Keep in mind, there is money to be made from illness and death. We have witnessed it in the strategy of “No”. I now see how anger has its place for action, and love can be a journey with an uncertain destination.